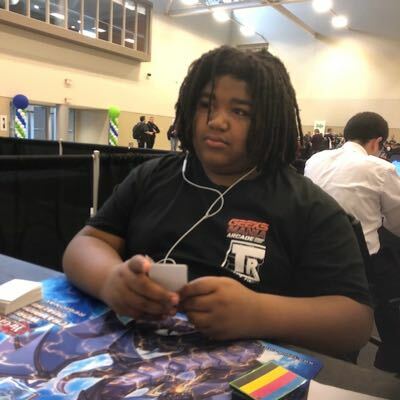 Charley Futch is the 2018 Dragon Duel World Champion, and he’s here this weekend in the hunt for his first YCS win, competing with Goukis! So far he’s 6-2, and with two Rounds of Swiss competition left in the tournament every win is critical from this point forward. His opponent is Maximillian Reynolds, piloting the same Dark World Danger! FTK deck that we saw Jeff Jones play in our Round 3 Feature Match back on Day 1. Reynolds has the same 6-2 record, so a loss in this Round or the next could threaten his survival in the tournament. Now that the field has narrowed everybody left at the top tables knows what Reynolds is playing, so Charley knew exactly what he was in for. One of Dueling’s greatest rising stars and newest Champions is about to go head-to-head with one of the most unpredictable and dangerous strategies in the tournament! Can Charley Futch find a solution to the Cannon Soldier Firewall Dragon combo? Or is Maximillian Reynolds on his way to the Top 32? We were about to find out. Futch opened with Junk Forward and Instant Fusion for Invoked Raidjin, combining them to Link Summon Isolde, Two Tales of the Noble Knights. That got him Gouki Riscorpio, and he sent Divine Sword – Phoenix Blade to his Graveyard from his Deck to Special Summon GoukiOctostretch. He Link Summoned Summon Sorceress next, used Octostretch to get Gouki Suprex, and Summoned it so he could Special Summon Destiny Hero – Malicious with Summon Sorceress. He combined Malicious and Suprex to Link Summon Knightmare Phoenix, searched Gouki Headbatt, banished Malicious to Special Summon another, then Link Summoned Firewall Dragon next to Knightmare Phoenix. Futch Special Summoned his third Destiny Hero – Malicious, then spent a moment considering his next move. 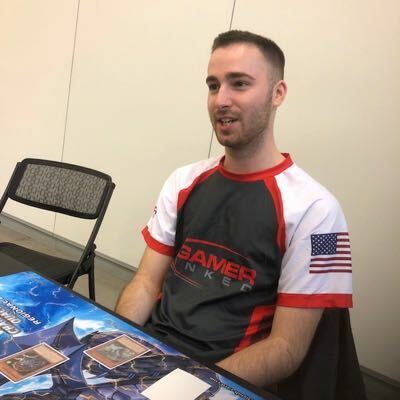 He settled on Gouki Re-Match, reviving Suprex and Octostretch, and used Malicious and Octostretch to Link Summon Knightmare Cerberus on the opposite side of Firewall Dragon. He banished Raidjin and Isolde to get back his Divine Sword – Phoenix Blade from the Graveyard, then used Knightmare Phoenix to Link Summon Knightmare Mermaid, pitched the Sword to Special Summon Knightmare Corruptor Iblee from his Deck, and drew a card. He then combined Iblee and Headbatt to Link Summon Binary Sorceress, making Chain Link 1 Firewall’s Special Summon, Chain Link 2 Headbatt, and Chain Link 3 Iblee, and Chain Link 4 Firewall’s retrieve effect. He got Junk Forward, Gouki Headbatt, and Gouki Octostretch; gave Reynolds Knightmare Corruptor Iblee; searched Twistcobra; and Special Summoned it. He then Link Summoned Tri-Gate Wizard next to Binary Sorceress to search another Gouki Re-Match. He finished his Extra Link by playing Gouki Octostretch for Linkuriboh! Reynolds was up, holding a hand of Allure of Darkness; Danger! Bigfoot! ; Danger! Mothman! ; Danger! Thunderbird! ; Broww, Huntsman of Dark World; and Snoww, Unlightof Dark World. He switched Iblee to attack mode, swung it into Knightmare Mermaid to destroy Iblee, and moved to Main Phase 2. He Set Allure, revealed Bigfoot, and shuffled up his hand: Futch picked Broww, discarding it. Reynolds Special Summoned Bigfoot, drew Danger! Dogman!… and Futch cut him off from Broww’s effect with a Chained Droll & Lock Bird. “You’ve got it…” Reynolds conceded immediately. “Was it the Droll?” asked Futch. Charley Futch takes a commanding win in the first Duel of the day, dominating with an Extra Link off a back-breaking Droll & Lock Bird! Reynolds was behind the eight ball, but he’d have the advantage of going first for a possible FTK in at least the second Duel. This time around Reynolds’ hand was Broww, Huntsman of Dark World; Soul Charge;Danger! Dogman! ; and two copies of Danger! Bigfoot!. He Set Soul Charge and revealed Bigfoot! for its effect: Futch picked the Bigfoot! and Reynolds activated the second one… Futch picked that one too! With both Bigfoots discarded Reynolds activated Danger! Dogman!’s effect. This time Futch couldn’t find it, and discarded Broww instead. Reynolds drew Danger! Nessie! with the Dogman’s ability, but Futch had another Droll & Lock Bird for the Broww! Devastating. Maximillian set to work looking through his Extra Deck. It was a rough start, and everything now hung on that Soul Charge. He activated Danger! Nessie!’s effect, and after some brief rulings confirmation that it was a legal activation under Droll & Lock Bird (it was) Nessie was discarded. Reynolds flipped the Soul Charge. “That’s a good card,” quipped Futch. “It’s not a bad one,” agreed Reynolds, as he figured out his plays. “It’s one of the better ones I’ve drawn.” He Special Summoned Bigfoot! and Nessie. He overlaid them to Xyz Summon Number 42: Galaxy Tomahawk, Special Summoning four Battle Eagle Tokens alongside his remaining Bigfoot. He combined a Battle Eagle Token with Tomahawk to Link Summon Reprodocus, traded a Token for a Link Spider, made it a Dinosaur with Reprodocus, then combined both Links for Summon Sorceress. He Special Summoned Cannon Soldier with Sorceress (she was pointing to a Battle Eagle Token, a Machine-type), and combined the Soldier and the Token to Link Summon Knightmare Phoenix. He used Sorceress and his last Battle Eagle Token to Link Summon Firewall Dragon. Futch activated Magical Mid-Breaker Field. He followed it with Sky Striker Mecha – HornetDrones, Special Summoned a Token, Normal Summoned Gouki Octostretch, and Link Summoned Isolde, Two Tales of the Noble Knights. He searched Gouki Headbatt and GoukiRiscorpio, sent Divine Sword – Phoenix Bladeto the Graveyard to Special Summon Octostretch, and then pitched Riscorpio to Special Summon Gouki Headbatt. He Link Summoned Summon Sorceress next, Special Summoning Destiny Hero – Malicious from his Deck, then combined Malicious and Headbatt to Link Summon Knightmare Phoenix. That got him Gouki Suprex. He banished to Special Summon another Malicious, Link Summoned Firewall Dragon next to Knightmare Phoenix, banished to Special Summon his last Malicious, then retrieved his Divine Sword – Phoenix Blade. He traded Knightmare Phoenixfor Knightmare Mermaid, pitched the Sword, and Special Summoned Knightmare Corruptor Iblee to Draw. One Link Summon later he had Binary Sorceress, Firewall, Malicious, and Knightmare Mermaid. He searched Gouki Twistcobra, Summoned it next to Sorceress, and used it with Malicious to Link Summon Knightmare Cerberus. He got back three Goukis from his Graveyard, searched Gouki Re-Match from his Deck, and continued on. 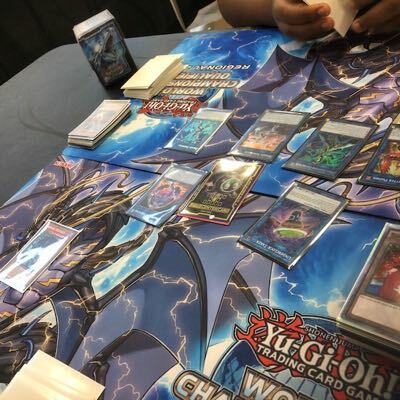 He Special Summoned Suprex, used it with Cerberus to Link Summon Tri-GateWizard, Special Summoned an Octostretch, and completed his Extra Link with Linkuriboh in the second Extra Monster Zone. 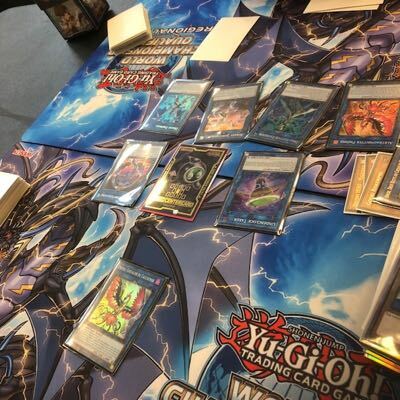 Gouki Re-Matchbrought back Suprex and Octostretch, Futch used them to Link Summon Knightmare Phoenix, and used Octostretch to replace Linkuribohwith Underclock Taker. He moved to battle. Futch attacked Bigfoot! with Firewall Dragon, destroying it, and then considered his next attack before committing: Tri-Gate Wizard pressed damage over Reynolds’ Firewall. The Tri-GateWizard had 3450 ATK, knocking Reynolds for another 900 damage and putting him to 4550 Life Points. Futch moved to Main Phase 2. He activated Tri-Gate Wizard’s effect to banish Firewall Dragon, Reynolds Chained Firewall’s effect to bounce, and Futch negated it. Firewall was banished, Reynolds drew his card for next turn, and immediately extended the hand. Charley Futch has Droll & Lock Bird in back-to-back games, shutting down Maximillian Reynolds from all angles to move on with a 7-2 record! One more win and Futch was a lock for the Top 32.